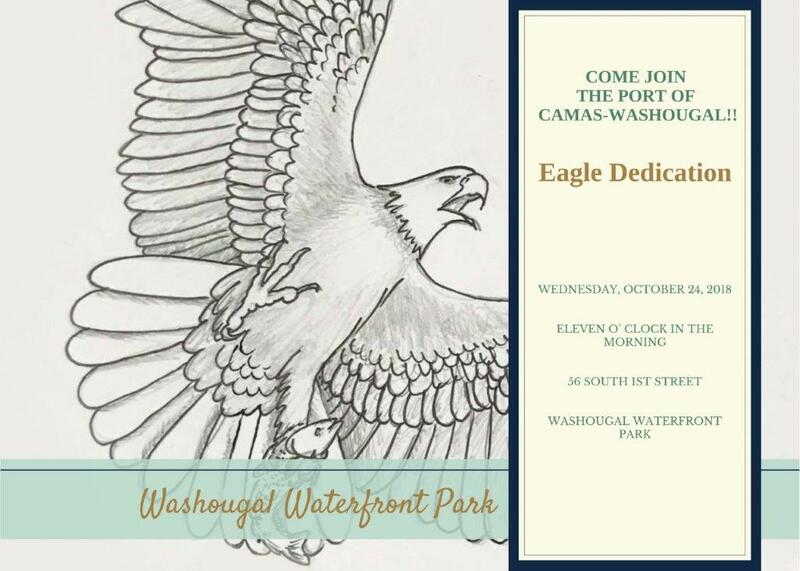 Port of Camas-Washougal Invites You To Attend the Eagle Dedication Ceremony. Washougal Wash. – October 8, 2018 – The Port of Camas-Washougal is pleased to invite the community to join us for the bronze eagle dedication ceremony. This stunning bronze statue, created by artist Heather Soderberg-Green, will be unveiled at the Washougal Waterfront Park at 56 South 1st Street, Washougal, WA 98671 on October 24, 2018. We are very excited to bring to the community this beautiful bronze sculpture. Art is such an integral part of our community and its rich history. 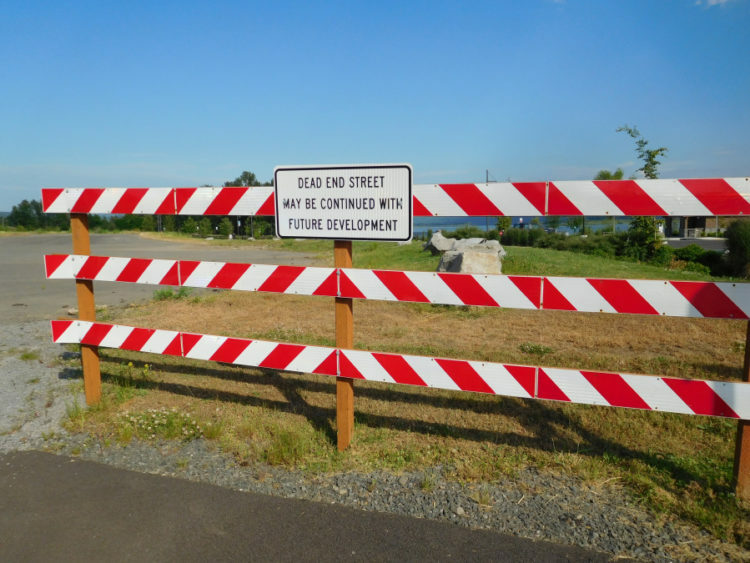 Port of Camas-Washougal: Development on the Horizon? 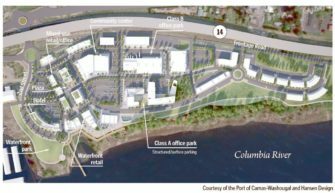 Port of Camas-Washougal officials took the next step toward waterfront development this month when they sent out a request for proposal for plans to build out the 26.5 acres it owns east of Waterfront Park. The request was distributed locally, as well as in Seattle, San Francisco, Los Angeles and Denver, according to David Ripp, executive director of the port. Port officials are looking for mixed-use development on the waterfront, with early visioning for the site calling for residential and commercial development, with plenty of open spaces and landscaping. Some design plans for the space have shown the possibility of a plaza with nearby retail space and a hotel, as well as an office park. Ripp said the port will have some flexibility when it comes to working with a developer; the port would be open to a developer purchasing property, a long-term ground lease or a public-private partnerships. Along with the 26.5 acres of port property, Killian Pacific owns about 8.5 acres to the east of the waterfront property, where the Vancouver-based commercial real estate developer will develop a residential complex. The overall project will consist of 150 to 250 units, potentially developed in phases, according to the request. 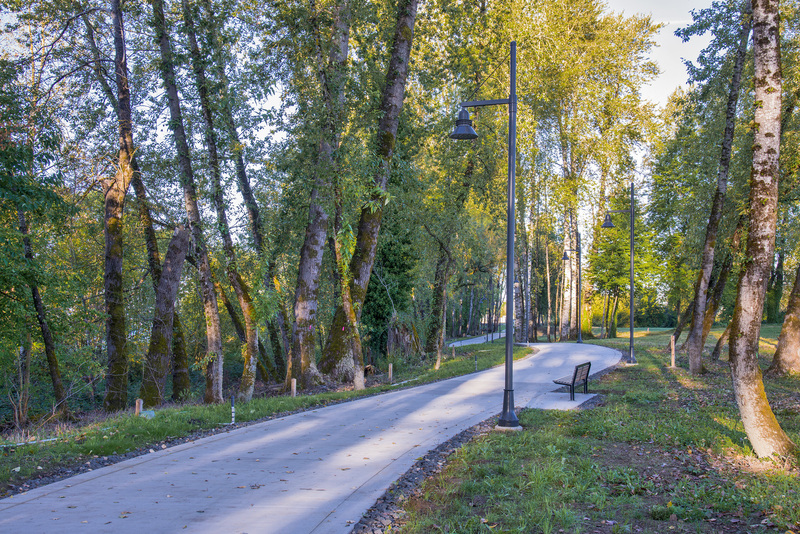 The port finished building the Washougal Waterfront Park and Trail in 2016, connecting the port property to downtowns in both Washougal and Camas. According to the request for proposal, the former Hambleton Bros. Lumber Co. site was appraised at $13,734,000 in May 2017. 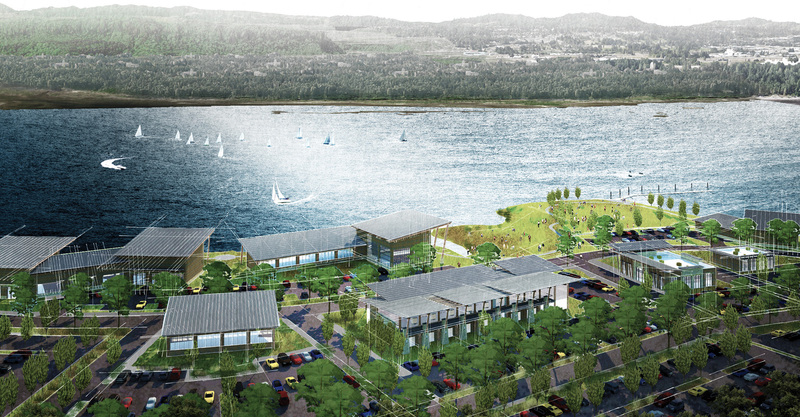 Roughly $16.3 million has been invested in the waterfront so far, according to the proposal. The property cost $12 million, building the waterfront park and trail cost $3.3 million, a Department of Ecology cleanup of the site cost $785,000, and conceptual design, master planning and infrastructure design for the site cost $215,000. Ripp said there isn’t a timeline for the development. Responses are due by Oct. 19, and port officials will review the submissions from Oct. 22 to 31. The port will interview developers Nov. 5 through Nov. 16 and choose someone shortly after, Ripp said. Construction could start in 2020, with completion of the first phase in 2021, Ripp said. Ripp said he wouldn’t be shocked if things moved faster than expected. He said port officials gave themselves five to seven years to complete each phase of the port’s industrial development, and each phase has been done in about three years. He said the project could be completed in as few as 10 years. 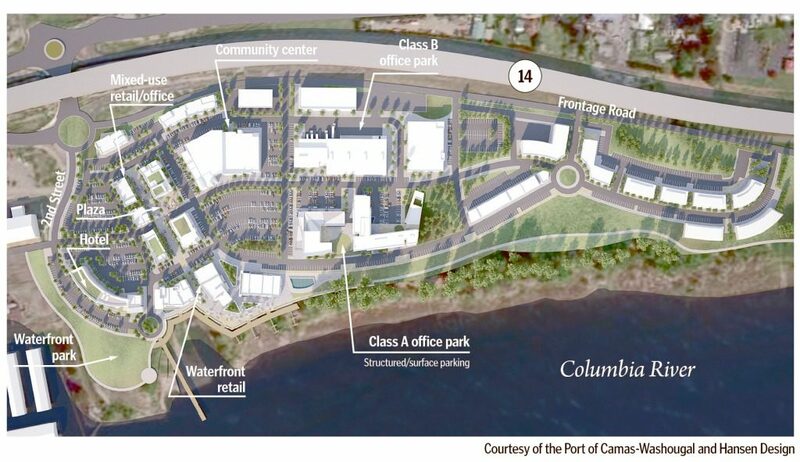 Paul Dennis, CEO of the Camas-Washougal Economic Development Association, said the waterfront property should help improve the economy of east Clark County, working in partnership with Camas’ destination downtown and Washougal’s burgeoning business scene. Dennis said each area having its own unique characteristic can draw people in, while their connectivity can help bring people from one spot of east county to another. Dennis praised port officials for getting the property ready for development, and for working to ensure whatever is developed at the site will fit in with the surrounding areas. With the new park, already-popular marina, and soon-to-open revitalized Black Pearl, Dennis said people are visiting the waterfront in east county more. The port’s waterfront property will help drive even more people to the area, he said. 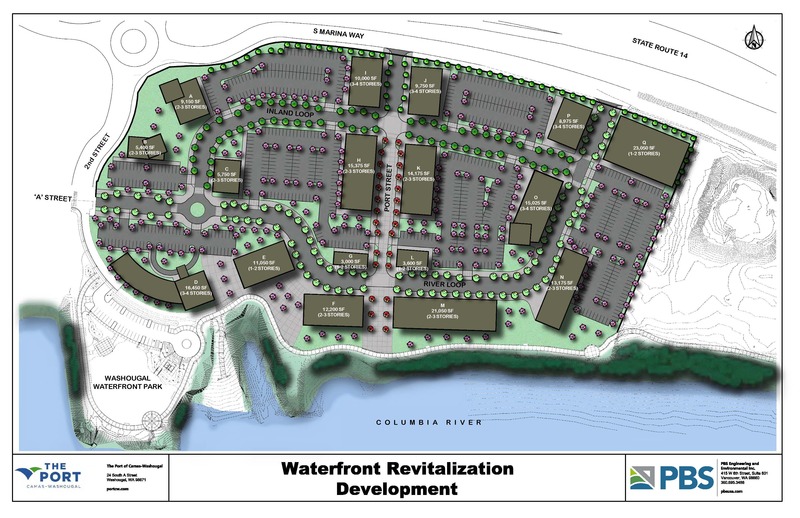 With the Port of Camas-Washougal’s recent finalized purchase of land on the waterfront, the next step is to issue a request for proposals from developers. The port purchased 11 acres — located on part of the former Hambleton Lumber Company property, at 335 S. “A” St., Washougal — from Killian Pacific for $5.98 million. After that purchase, the port owns a total of approximately 31.5 acres of waterfront land zoned highway commercial. Port of C-W Executive Director David Ripp mentioned to port commissioners during their Monday, Aug. 6, meeting that he plans to have a request for proposals ready for the commissioners to discuss during their next meeting at 5 p.m., Monday, Aug. 20. Ripp said the developer will help the port in the development of the site — potentially through land purchase, lease or a public private partnership. “The greatest help will be from their vast experience from other projects as well as their clientele list,” he said. Ripp said in a news release the port’s mission and intention is to maintain public access to the waterfront in any future development. Killian Pacific, a commercial real estate development and investment company based in Vancouver, bought 8.5 acres, located on the east end of the waterfront, from the port for $2.53 million. Killian Pacific plans to develop 150 to 250 rental units that will probably be apartments, located adjacent to the port’s pedestrian waterfront trail, as well as the future natural play area and a one-acre park. Ripp said the port paid more per acre than Killian because of the location and proximity to infrastructure. Port of C-W Commissioner Bill Ward is hoping the future waterfront development will include a place where the Vancouver Symphony Orchestra and other musicians, actors and actresses can perform. Ward, a season ticket holder and contributor to the Vancouver Symphony’s annual campaign, remembers visiting the Sydney Opera House, in Sydney, Australia, while on vacation 25 years ago. “We have an opportunity to do something equally novel and iconic,” he said. Ward said a cultural center, combined with a conference center, would complement and encourage development of a corporate office park that would bring good paying jobs into the community. “The center would provide common space for business conferences and expositions,” he added. Ward said the port would probably own and manage the cultural and conference center. “A large contribution would be inherent from interests in the community (for) naming rights,” he said. Ward said restaurants would complement the office use and provide a reason for people to visit the waterfront. “And we don’t want to compete with our downtowns,” Ward added. Port Commissioner John Spencer said he likes the idea of a cultural center on the waterfront, in principle, but he would need to see a proposal. “I doubt the port has the (financial) capacity to build one, so it would probably need to be a private venture or a public private partnership,” he said. 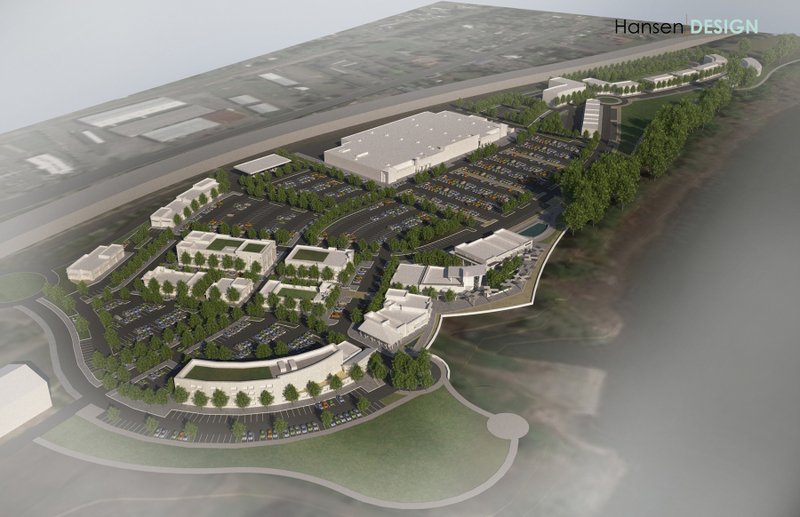 Spencer’s wish list for the Washougal waterfront includes shopping, restaurants and offices. Port Commissioner Larry Keister said the focus of the local waterfront development will be to provide jobs and business opportunities. 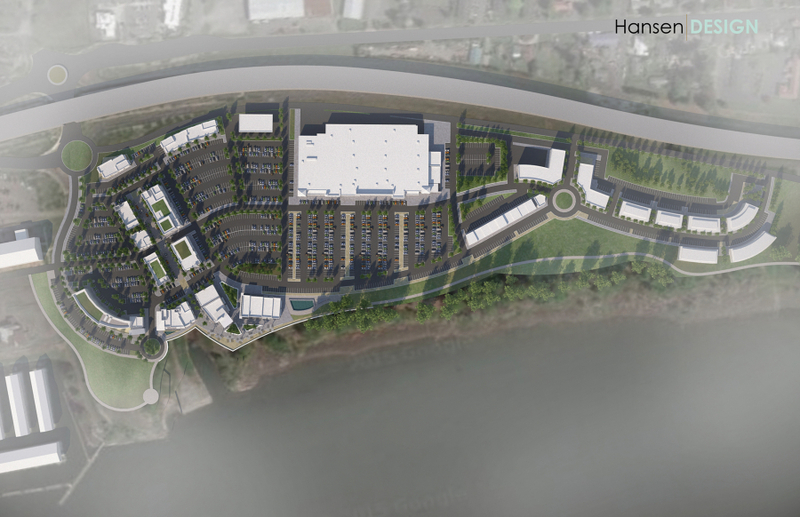 Keister referred to the direct access to the Columbia River and a walking trail that will connect the port development with downtown Washougal. He envisions restaurants, coffee shops and locations where people can enjoy the waterfront views, as well as a boutique hotel with a conference center, office space and co-op offices that can be used by business people who work out of their homes and need a temporary space to meet clients or hold meetings. Keister would also like to see a festival street that can be blocked off for special events, farmers markets or art and craft fairs. Keister said a performing arts building would be a benefit to the community by providing rentable space for live theater performances or musical events, classroom space for art, music, photography and dance lessons or rehearsals and a location for local artists to display their work. 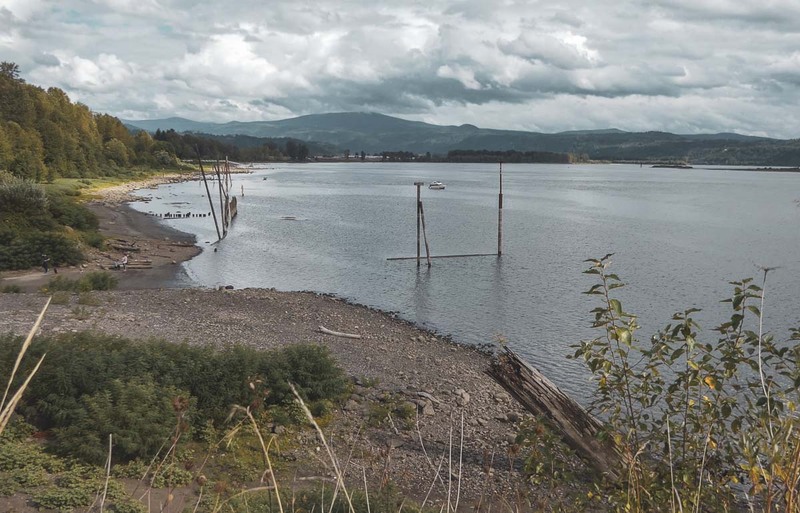 WASHOUGAL — The Port of Camas-Washougal announced this week the finalized purchase of 11.0 acres of waterfront property along the Columbia River, formerly known as the Hambleton Lumber Company site. The property is located adjacent to the existing Port recreational boating marina. As part of a Purchase Sale Agreement, Killian Pacific sold 11.0 acres to the Port and bought approximately 8.5 acres from the Port. The Port of Camas-Washougal paid $5,981,262.50 for the 11 acres of waterfront property and sold the 8.5 acres to Killian Pacific for $2,533,445.67. David Ripp, executive director of the Port of Camas-Washougal stated, “I’m pleased we have been able to secure public access to the waterfront. What’s more, this purchase will enable the port to directly connect our existing land to the east and provide a way for the community to enjoy amenities along the length of the port-owned waterfront once the Waterfront is developed. The Port’s mission and its intent is to maintain public access to the waterfront in any future development. The property is designated Highway Commercial and with the addition of the 11.0 acres totals approximately 31.5 acres of Port holdings. Killian Pacific purchased a portion of the eastern boundary of the Port’s original 14-acres and is developing a residential housing element to the Parkers Landing mixed-use expansion. The property is adjacent to the Port of Camas-Washougal’s pedestrian trail and soon to be constructed Natural Play Area fronting the Columbia River with a 1-acre park inclusive in the design. Even with development, Port of Camas-Washougal officials want to make sure the waterfront property stays green. After a year-plus of discussing ideas for how the 40-plus acres of waterfront property should be developed, and what that should look like, the port received a 3-D rendering of its Washougal Waterfront Vision and Master Plan from Hansen-Design President David Hansen earlier this month. The plan calls for a mix of residential and commercial development, with plenty of open spaces and landscaping throughout the 40 acres. The port owns about 27 acres of the property, while the remaining 13 acres are owned by Parker’s Landing, which is represented by Vancouver-based commercial real estate developer Killian Pacific. Killian will handle developing the east side of the property, where the residential portion will go. That part will be developed first, with a plan in place and construction starting in the next 12 to 18 months, according to David Ripp, executive director of the port. The commercial development will follow the residential. Getting the residential piece in place first is intended to help drive the commercial side, Ripp said, since there would be a built-in base of people nearby. Still, he knows that for the development to live up to its potential, it can’t rely only on people who live there. Ripp would also like to see businesses come in that will allow residents to interact with the property, like a place where visitors can get stand-up paddleboards. The plan partly comes from residents and ideas discussed during three public meetings the port hosted to ask residents what they want out of the new development. The open spaces throughout will help guests get right up to the water, and it can lead to the port hosting a variety of city events and festivals. There is already some recreational space down at the waterfront, as the port opened Washougal Waterfront Park, 56 S. First St., Washougal, in September. 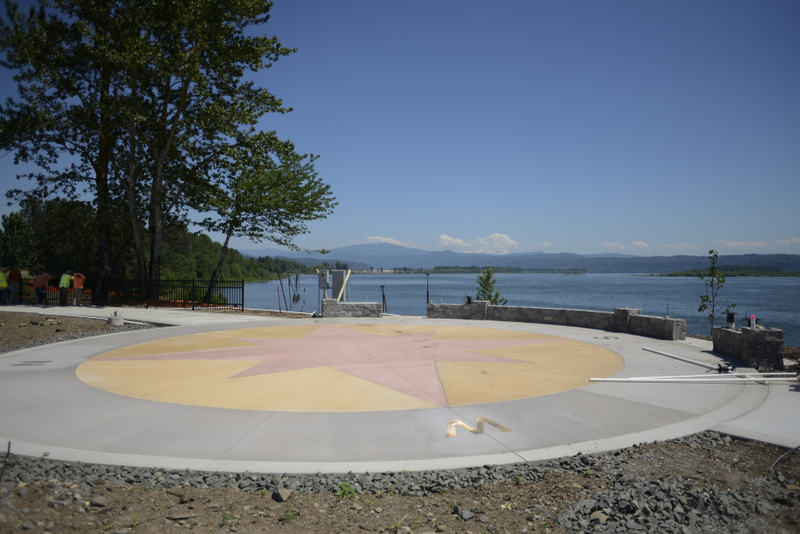 One of the main features of the park is a concrete compass rose overlooking the Columbia River, and a trail that is already seeing heavy use, Ripp said. Plans also call for an interactive play area along the trail. The city is trying to secure funding to extend that trail over to Steamboat Landing Park, and if it can connect the two, visitors would be able to take the trail from the waterfront park property to downtown Washougal. “That connection between the port and the downtown is a critical piece to connect Washougal to the river,” said Suzanne Grover, the city’s parks, cemetery and facilities manager. Grover said the city applied for some grants for the $1.7 million project, and is waiting to hear if the project is included in any state funding. 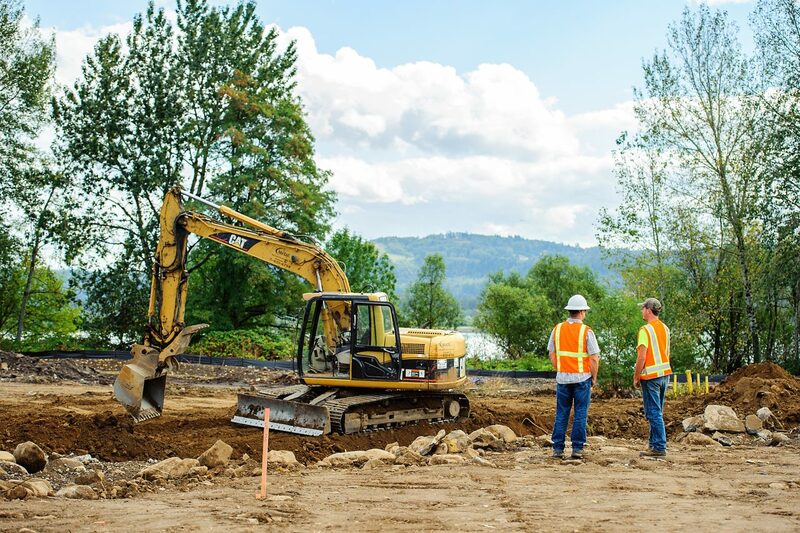 The immediate priority for the Port of Camas-Washougal is getting the waterfront development off the ground. That is according to Port Commissioner John Spencer. Spencer said later he expects the port will lease land for development and build commercial/retail buildings for lease. The port owns 27 acres, and Parker’s Landing LLC owns 13 acres of the former Hambleton Lumber Company property at 335 S. “A” St., Washougal. Parker’s Landing LLC is represented by Killian Pacific President Lance Killian. Killian Pacific is interested in purchasing some of the port-owned land on the east end of the waterfront. That area is expected to include rental residential development. The port is not chartered to be involved in residential development that does not have commercial or retail businesses tied to it. Multi-family and single-family residential are among the development options mentioned by David Hansen, a Seattle architect hired by the port to create a master plan for the land. Port Executive Director David Ripp said options include the port swapping, leasing or selling land to Killian Pacific. Commissioner Bill Ward has said he would favor swapping or leasing land. Spencer and Commissioner Bill Macrae-Smith have indicated they are open to the potential of selling some of the waterfront land for residential development. Ward said the port should request proposals for competitive pricing from companies interested in buying, leasing or developing some of that land. “We should avoid sole source procurement and insure the value of the property would be realized,” he said. Killian was present for some of the discussions during the retreat. Port Attorney Carolyn Lake recommended further discussions occur during an executive session. Those talks are expected to occur during an executive session Tuesday, Feb. 7, following the port commission’s next regular meeting at 5 p.m., in the port office meeting room, 24 S. “A” St., Washougal. Executive sessions are closed to the public. Ripp said selling land at market value is not gifting. He referred to the Steigerwald Commerce Center where there is an asking price per square foot. “We are not taking bids,” Ripp said. He mentioned the uniform look of commercial, office and retail buildings, as the port partners with Killian. The waterfront developments are expected to be built in phases and blocks. “Residential is priority one for commercial,” Ripp said. Killian said residential development will provide “built in customers” for the commercial and retail businesses. Ripp said there is a potential $1.5 million sale of approximately six acres in the Steigerwald Commerce Center. A manufacturing company is interested in locating there. “There has been 100 percent occupancy for almost four years,” Ripp said regarding the port’s industrial park. Construction bids for Building 18 will be requested in mid-April or early May. The project is expected to be completed during the first quarter of 2018. The 50,000-square-foot metal pre-fabricated building will be located east of the Waste Connections transfer station, 4020 S. Grant St. The port has pre-leased 6,600 square feet in it. “The building has not been constructed yet, and this company has advised they would like this space to lease before it’s available,” Ripp said. The name of the interested company was not made public. The lease will be up for port commission approval in the late spring. Another company is interested in leasing 3,300 square feet. Johansson Architecture, PC, of Battle Ground, is the architect for Building 18. Last month, I was at a dedication of a new addition to the Port of Camas-Washougal. Local politicians and economic development folks filled the tent and honestly, it was the type of event that a conservation leader like me is not typically asked to attend. But this was not a typical port dedication. This was the dedication of the Washougal Waterfront, a stunning gem of a park and trail along the Columbia. Looking south to Mount Hood and east to the Gorge, it’s hard to imagine this serene spot was once an old mill site or that such an oasis even exists as you whiz by in your car on Washington State Route 14. But it sits just over three miles from the Columbia River Gorge National Scenic Area, which begs the question: Why does Friends of the Columbia Gorge care? We care because of Gorge Towns to Trails, a vision for a trail system wrapping around the Gorge, exploring hidden waterfalls and vistas and connecting into communities to allow multi-day trekking with hikers staying in towns and B&Bs, much like you would see in Europe today. It’s a vision that will protect more land, provide relief to overused trails, and give Gorge communities an economic boost. The Port of Camas-Washougal saw the benefit that Gorge Towns to Trails could provide to their community and became determined to make this spot the trail vision’s western Washington launch point. They have worked with Renee Tkach, our Gorge Towns to Trails Manager, who helped the port land a $700,000 state grant to build the park. We are working with the port to take trails from this park east through Washougal and eventually to Steigerwald National Wildlife Refuge. The port is also looking at trail systems west to connect to Camas, Vancouver and eventually Ridgefield National Wildlife Refuge. That’s right, a refuge-to-refuge connection. I was beyond proud to watch Renee give the best speech of the day at the dedication (well worth five minutes of your time) as she laid out the vision and spoke of what we, a collective “we,” did to make this happen and how “we” aren’t even close to being done. Port officials, businesspeople and conservative politicians all nodded in unison with enthusiasm. When we launched Gorge Towns to Trails, I didn’t know where it would take us and we deliberately chose to not predetermine how this vision would play out. I thought we would be working to build trails in the National Scenic Area and then work to connect them into communities. However, the opposite has been true. It is the communities who are the catalysts, wanting to be the launching points and working to extend trails from their communities out into the National Scenic Area. We now have two communities, Mosier and Washougal, who have built trails from their towns and highlight Gorge Towns to Trails as part of their signage. Gorge Towns to Trails is now in the master plan for the town of North Bonneville’s trail vision. Finally, our land trust is whittling away at those remaining connection properties to make trails from Washougal to Stevenson and Hood River to The Dalles possible one day. Gorge Towns to Trails is opening doors and taking us places we could not have imagined five years ago. While we still have a long, long way to go, a visit to Washougal’s Waterfront Park will help you believe in the possible and look east with optimism and anticipation of what lies ahead. 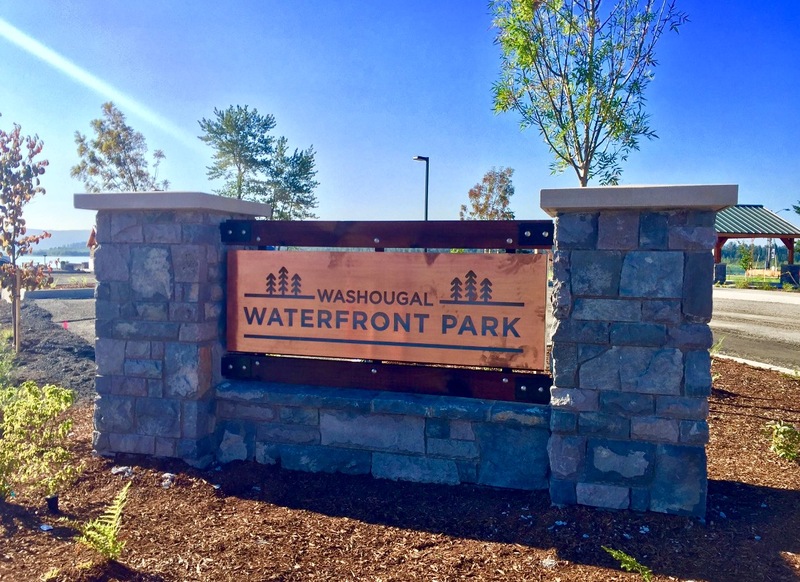 Tomorrow the Port of Camas-Washougal will celebrate the Grand Opening and Ribbon Cutting of the Washougal Waterfront Park and Trail. MFA is excited to see this project completed, which began with an Integrated Planning Grant that MFA assisted the Port in receiving from the Washington State Department of Ecology. This project was a great combination of public and private entities, working with Ecology to help a community develop a brownfield and establish public access to the Columbia River waterfront. We hope to see you there to celebrate this monumental accomplishment! Click on the link to find out all the details of the Grand Opening and Ribbon Cutting. By Aaron Corvin, The Columbian, Vancouver, Wash.
June 18–If they wait a while, carefully pick the right strategy and if they hit the right market conditions, the Port of Camas-Washougal and a private developer may be able to transform 40 acres of waterfront property into a profitable destination point that draws visitors from the Portland-Vancouver region. But that option carries problems of timing and risk. There are other, safer alternatives that could lead to the parcel’s redevelopment sooner, spurring new jobs and tax revenues. Those assessments are just some of the major takeaways from a 63-page market analysis that was delivered to port commissioners Tuesday evening by Eric Hovee, principal of E.D. Hovee & Company LLC, based in Vancouver. A decision on what direction the port should take with the property isn’t expected anytime soon. “There’s no rush to judgment here,” port Commissioner Mark Lampton said as officials discussed the market feasibility study during Tuesday’s public hearing. Hovee’s analysis focuses on the redevelopment potential of a 40-acre waterfront site that’s 1.5 miles west of Washougal’s downtown and bounded by Highway 14 and the Columbia River. The analysis, which spells out the advantages and disadvantages of various building scenarios, is intended to help the port and its partner — Killian Pacific, the Vancouver commercial real estate developer — achieve both public and private development goals for the site. The port owns about 67 percent of the waterfront parcel while Killian Pacific owns 33 percent of the site through its affiliate, Parkers Landing LLC. As port officials discuss the site’s long-term development potential, they’re moving to accomplish other related tasks. This week, for example, the port plans to formally request bids from companies on conducting environmental cleanup work at the site, a portion of which once housed a lumber mill. The state Department of Ecology is picking up 90 percent of the $860,000 cost of cleaning up the site, said David Ripp, the port’s executive director. The port will use liability insurance funds it recovered to pay for the rest of the tab. The cleanup work is expected to be finished by mid-October. The port also is seeking state grant funding to help pay for a new park and trail as part of the larger waterfront project. During Tuesday’s hearing, Hovee said it was possible to transform the site into a destination point but they’d have to define a vision, and find a company that not only agrees with that vision but can make a profit building it out. Commissioners grappled with the destination scenarios. Lampton said the waterfront site is a “jewel,” but that the question of how you make it into an attraction is “a tough one.” Most people in the area travel west, not east, to shop or to reach places, he said. Commissioner Bill Ward said he doesn’t necessarily agree with that view. The waterfront site is unique, Ward said, as opposed to the standard commercial development you find along such corridors as 192nd Avenue in Camas and east Vancouver. According to Hovee’s analysis, two other options — “community commercial center” and “commercial retail/office and residential mixed-use” — are feasible and merit more detailed evaluations. The “community commercial center” scenario would include up to 350,000 square feet of commercial space, mostly for retail/service uses but with room for build-to-suit office space. It would create 720 jobs at full build-out, and generate $4.6 million in one-time state and local sales taxes, as well as $6.6 million in annual sales and property taxes. That option “misses (a) major opportunity for waterfront living but avoids (the) risk of overshooting a not yet tested market,” according to Hovee’s analysis. Under the “commercial retail/office and residential mixed-use” option, the site would become an urban village, with about half of the property developed for retail and office purposes and the other half for apartments and townhomes. It would feature about 175,000 square feet of commercial development, 370 “high amenity” condos/apartments and 115 townhomes.